On our recent trip to Scotland we were lucky enough to enjoy part of their spring. We had three days of 22°C and other days with snow and temperatures hovering around the freezing mark. Spring brought with it sunshine, and lots of heather. The fields were amazing and we even did a little bit of walking when the weather permitted it. I have read so much about the honey in Scotland and I can say that heather honey is wonderful. It is very different to the honey we get here. A friend of mine keeps bees, and I buy my honey from her. The latest batch is truly amazing with a wonderful depth of flavour. As you cannot bring honey into South Africa I decided to make do with ‘second’ best and purchased some Scottish Wild Flowers in a mix of salt and other herbs. I used this to create my heather honey chicken dish. Do you have a special herb mix you use? 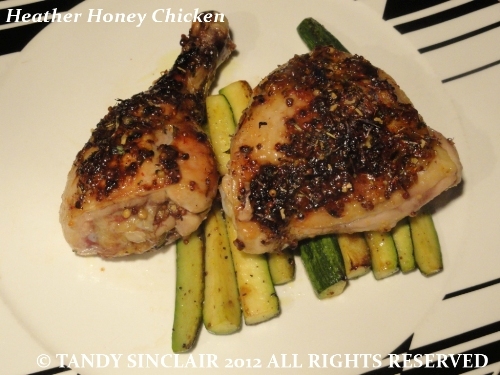 An easy yet wsuper tasty chicken recipe! 🙂 I love it! Scotland is such a beautiful part of the world isn’t it. I wonder why you can’t bring honey in? ooh I’m loving this chicken Tandy!! I like the simple ingredients you used! It looks delicious and so flavourful! haha..
What an amazing idea, Tandy, I live on the same landmass and I have never heard of using scottish flowers to cook with! I’m right on it! I love the flavors in this glaze! I’m sure it makes for a tasty meal. I wish I had bought more back with me!